an article about a college course where the life and works of Dr. Seuss are studied; 2. "Kindergartners Find Success in Writing" from The Republican (Springfield, MA); 3. "Study: Parents' Education Affects Kids" from United Press International; 4. "Burton Reflects on Life in Books" from the Bradenton Herald (Bradenton, FL), a look at Reading Rainbow host, LeVar Burton's 20-year career. I heard a story on NPR's Here and Now about the winter break session that M.I.T. students and teachers participate in. The session is called Independent Activities Period (IAP). M.I.T. community members are encouraged to take courses in something that is not directly related to their field of study. Some of the choices include Korean traditional drumming or sleight-of-hand or tango boot camp! The whole point is to get the students and teachers away from the pressures of M.I.T., let them relax, and as the program's website states, "offers opportunities for creativity and flexibility in teaching and learning." Don't you love to learn or participate in something new? I do! Here's where the public library comes in--it offers programs that present opportunities for adult life-long learning. Next week we'll be having a greeting card making workshop (if interested, sign up right away as space is limited). A few weeks ago we had sports writer, Bill Nowlin, who spoke about Ted Williams. In the past we've had speakers talk about organizational skills, analyzing dreams, hynosis and weight control. We've had a discussion of the film, Paper Clips followed several weeks later by a play about the holocaust. We've been entertained by a handbell choir and a classical guitarist. The opportunities have been many--I hope you've taken advantage of a few! I met my email friend, Kevan Atteberry, and I am pleased to say he is a delightful person! I saw some illustrations from a new book that he illustrated that will be out in the fall. I've already forgotten the name. (KK has brain overload from the retreat.) I'll be looking into ordering some books by the other talented authors and illustrators who attended. It was a wonderful four days--relaxing, fattening, intellectually stimulating (imagine hours spent discussing books), congenial, and fun! It is also fun to get back to work and see what I've missed. I've got a bunch of "Consideration for Purchase" forms on my desk, including one for a TV series (see "What? You're Not Buying TV Programs on DVD" message from 1/18), heard of one complaint about a program we offered (raised my blood pressure about 50 points), found out we purchased a new answering machine that we haven't completely figured out how to operate (see "Kitty vs. Machine" message from 1/19). I also found that I made a mistake on the "Community Reading" message from 1/24. I wrote that the program is co-sponsored by NH State Library. That is incorrect. The sponsor is the NH Center for the Book. I have made the correction, and I apologize for the misinformation. We arrived safely last night and if you think it's cold in Windham, then you'll think you're in Antarctica up here! When we arrived it was snowing. The place we're staying at is the Inn at Essex. It's a training inn for students of the NE Culinary Institute. And let me tell you, if I were grading them, they'd all get an A+. This morning we started with a lecture by Tim Wynne-Jones (author of A Thief in the House of Memory [YA WYN]) entitled "Telling It Slant: Showing Emotion through the Use of the Objective Correlative." Okay, I still can't define the term, but what Tim was trying to tell us was to find other ways of showing, for instance love, without saying "He was in love!" Perhaps we can look at the world through the lover's eyes and see things differently, and never mention what it is he is feeling, but, if we do it right, the reader would know he is in love. Does that make sense? After Tim's lecture we sat through part of a presentation by illustrator, Marjorie Priceman (see How to Make an Apple Pie and See the World [JP PRI]). Marjorie explained her thought processes in illustrating a picture book manuscript. As picture book writers, Andy and I found the talk enlightening. Since neither of us are illustrators, we decided to leave when we were told to get out our sketch pads and pencils! Andy has graciously lent me her laptop so I'm able to post this. Unless someone is willing to lend me a laptop for 4 days, KK will not be posting until 1/29. KK is heading to Vermont for a writers' retreat called "Kindling Words." Kindling Words is a gathering of children's writers, illustrators, and editors. I'm especially looking forward to going this year because an illustrator friend will be flying in from Seattle to participate. It will be our first face-to-face meeting after years of email correspondence. Kevan Atteberry is his name. You can check out Lunchbox and the Aliens by Brian W. Fields [J FIE] and enjoy Kevan's illustrations! I'm traveling to VT with a longtime writing buddy, Andrea (Andy) Murphy. You can read her book, Out and About at the Dairy Farm [JP MUR], too! I'm sure you've heard about the "one city, one book" programs where residents all read the same book and gather to discuss that particular title. Locally, Nashua Public Library has such a program called "Nashua Reads." Nashua P.L. partners with Rivier College to present the discussion and lectures. The next Nashua Reads title is Zorro by Isabel Allende [F ALL]. The program runs from the end of February through April 15. One of the supplemental activities is a fencing demonstration by members of the Amoskeag Fencing Center! The NH Humanities Council and the New Hampshire Center for the Book are in the planning stages of a statewide program they've entitled "The Big Read." The program will take place in October 2007. The book selected is Fahrenheit 451 by Ray Bradbury [SF BRA]. 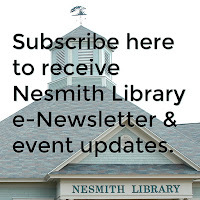 The Nesmith Library is planning on participating, so more information on the discussion will be forthcoming at a later date. Maybe we could have a film viewing and discussion of the 1966 adaptation. Or a lecture of censorship. Or a discussion about book burning in Nazi Germany. Or...If you have any ideas, I'd be happy to hear them, just post them in the comments section below. I'm particularly excited because the book is speculative fiction and my resolution for 2007 is to read something in that genre. This past Friday, a new store opened at our local mall--Sephora. When I was there on Sunday, the store was packed to the rafters with women and girls dabbing, spritzing, and brushing all manner of cosmetics and skin care products upon themselves. Being a kitty, my beauty regimen is usually a quick lick of the paw that is then run through my fur and whiskers. Non-felines might want to read up on total beauty--the library is the place to do it! Gross, Dennis. Your Future Face: The Customized Plan to Look Younger at Any Age [646.726 GRO]. Irons, Diane. 911 Beauty Secrets: An Emergency Guide to Looking Great at Every Age, Size and Budget [646.7042 IRO]. McEvoy, Trish. The Power of Makeup: Looking Your Level Best at Every Age [646.72 MCE]. Pedersen, Stephanie. K.I.S.S. Beauty [646.7042 PED]. Schwab, Christine. The Grown-Up Girl's Guide to Style: The Maintenance Bible for Fashion, Beauty, and More [646.7 SCH]. Queer Eye for the Straight Guy: The Fab 5's Guide to Looking Better, Cooking Better, Dressing Better, Behaving Better, and Living Better [646.7 QUE]. I attended a meeting of reference and adult services librarians this morning and came away feeling energized and full of hope for a project we are working on together. This project is entitled READS-TO-GO and it will be a collection of contemporary books that are often requested by book discussion groups. Fifteen copies of each title will be packed in a sturdy book bag that will include discussion questions and other materials. The bags will be available as part of NH's interlibrary loan request system. As simple as the idea sounds, there are many aspects of the planning and execution of the project that have to be considered. For example, how are the books within each bag processed? Should they be covered with adhesive plastic? Should there be a pocket in each book or just on the bookbag itself? The questions that arise seem rather nitpicky, but if we don't look at all the angles, we're bound to forget something important. We've also been looking into grant programs to help finance the purchase of the bags, books, and materials. So...if you're interested in donating, let me know! In driving away after the meeting, I felt really good. But then, on NPR, I heard a piece about today, January 22, being the most depressing day of the year! Say what? Yes, the weather, after holiday bills, broken resolutions, etc. all contribute to this depressing day. But, the researcher who determined that today would be awful, also determined that June 22 will be the best day of the year! Rejoice! The best is yet to come. Let's all plan a library party on Friday, June 22. Are you game? Kurious Kitty has had a run-in with a copier that thinks it knows what KK wants and ignores all instructions. But guess what, it doesn't know what I want. I know what I want! So...it is time to look on the bright side. To do this, I will recommend a few books to help achieve mental peace. A recent children's picture book explores zen philosophy with a simple but satisfying story of a cat and a dog: The Gift of Nothing by Patrick McDonnell [JP MCD]. 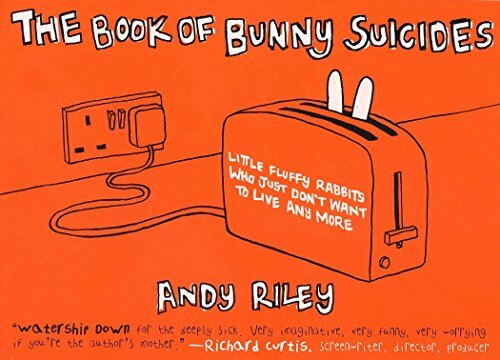 Okay, the next recommendation is sick, but after you've finished laughing, I'm sure you'll be nice and relaxed: The Book of Bunny Suicides by Andy Riley [YA 741.5 RIL]. We also own the movie, Midnight Run [DVD MID]. I think this one is hysterical! If you need some help with anger management, beyond reading funny books, check out the self-help books in 152.4. Or, if worse comes to worse, kick the copier (Jane), or the FAX machine (Gretchen), or the printer--just don't let the boss see you! What? You're Not Buying TV Programs on DVD? No, we're not! We've come to this decision after much thought. Basically it comes down to cost. Think of the vast number of current and past shows that are now available on DVD. A season set can cost anywhere from $30. all the way up to about $90. Multiply that by 5 or 6 or more seasons, then it gets pretty pricey. If one disk is damaged or lost, then the individual disk cannot be replaced without buying the whole season set! This is also a primary reason for not offering to get these items for you on interlibrary loan. These items have limited availability around the NH, and, if they are in another library's collection, the library often doesn't want to loan them out due to their costliness. What we're doing here is to complete any series that we had already started. For instance, if we had Hogan's Heroes, seasons 1 and 2, then we would continue to order the other seasons as they became available. We also will purchase some of the literature based classics that are produced by PBS and the BBC. An example would be a Jane Austen book such as Emma that has been made into a mini-series. Of course, if you have the complete I Love Lucy on DVD (all 9 seasons) and you wish to donate it, then we would love to accept it! 5 syllables, 7 syllables, 5 syllables in three lines format. Basically, haiku is one-breath poetry. Usually you can recite a haiku in one breath and it is 17 syllables or less! If you haven't read haiku, I would highly recommend it! Cool Melons--Turn to Frogs! : The Life and Poems of Issa by Matthew Golub [J 808 GOL]. The Essential Haiku: Versions of Basho, Buson and Issa [895.6 ESS]. The Haiku Anthology: Haiku and Senryu in English [808 HAI]. The Haiku Seasons: Poetry of the Natural World by William J. Higginson [895.6 HIG]. The Library is closed today due to the ice storm. Electricity is out, the telephone is out, the parking lot is treacherous, so we hope you'll understand the reason for the closing! If you'd like to see NH encapsulated in ice, visit WMUR's website and click on "Images" in the "Severe Weather" section. It's fun to look at as long as you don't have to work in it! Bless the utility workers! The nation is sick. Trouble is in the land. Confusion all around. That's a strange statement. But I know, somehow, that only when it is dark enough, can you see the stars. After nearly 39 years, the nation is still sick. We are more troubled and more confused than ever. But, I think it is dark enough, and now it is time to start looking for the stars! Yes, I know it's only the second week in January, but really, spring training is just around the corner, and opening day will be here before you know it. Next Thursday, 1/18, at 7:00 pm we have sportswriter, Bill Nowlin, coming to the library to speak about "Ted Williams, Baseball Legend." Nowlin is the author of more than a dozen books about the Red Sox, and Ted Williams, and is a frequent contributor to the Boston Globe. The late Ted Williams played ball for the Boston Red Sox from 1939 to 1960 (with a little time off during WW II and the Korean War). That's an incredible span of time! 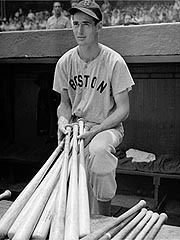 During those years Williams earned baseball's Triple Crown for the best batting average, most home runs, and most runs batted in, a total of three times. He had 521 home runs, 1839 runs batted in, and a batting average of .344 during his career with the Sox. And, as befitting a legend, Williams hit a home run his last time at bat! Besides the talk, Mr. Nowlin will have some of his books available for sale and signing. Reading will keep you busy between now and opening day! Put next Thursday on your calendar and join us! Take a look at the American Film Institute's list of top comedies, "100 Years...100 Laughs" and see if your favorites are amongst the top 100. While you're there check out their other lists, too! I know there are a few funny films that have slipped my mind, so maybe I'll do a Favorite Funny Films part deux. Why is it that humorous books aren't afforded the same respect as those written about weighty subjects? What's wrong with making a reader laugh? Nothing, I say! With the world situation what it is--war, global warming, poverty, etc., I find myself wanting to read humorous books almost exclusively! Many of my favorites have an adolescent main character. It's not that I like to laugh at teens, it's just that I recognize myself in the character, so, I'm laughing at myself! Take a look at some of these fiction titles and be prepared to enjoy yourself! Bradford, Richard. Red Sky at Morning. Kluger, Steve. Last Days of Summer. If you have a favorite humorous book, please post it in the comments section. Tomorrow I'll tell you a few of my favorite funny films. The above is one of my favorite quotes from that sage writer, Anonymous, a.k.a. Author Unknown. I love books of quotations and proverbs. I often flip through them looking for just the right thought. I figure why bother to come up with something original when someone has already expressed the thought better! Bartlett's is known as a main source for quotes, and with the internet, the perfect one is only a click away! 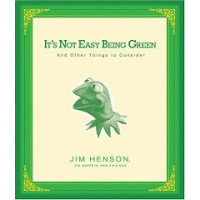 It's Not Easy Being Green: And Other Things to Consider by Jim Henson, the Muppets, and Friends [791.93 HEN]. Mouthing Off: A Book of Rock & Roll Quotes by John D. Luerssen [781.66 LUE]. The Pooh Book of Quotations: In Which Will Be Found Some Useful Information and Sustaining Thoughts by Winnie-the-Pooh and His Friends by A.A. Milne [J 828 MIL]. Everyday we see DVDs returned to the library with tiny teeth marks along the cases. Parents are obviously letting their little ones chew on them. This is, or course, not a deliberate action. You don't give a baby something to chew on that can pose a health risk, but, if leaving the library, your baby wants to "hold" the Elmo DVD, chances are you'll let him or her do it. With babies and toddlers everything ends up in their mouths. It's their way of learning about the world. If we could, we'd make sure every item that leaves the library is perfectly safe. But, we can't. So, parents, think before you hand over the DVD. Avoid polyvinyl chloride (PVC) products, including vinyl shower curtains and toys and packaging that bear the number "3," indicating they’re made with PVC. I checked some of the library's DVDs and found the number on the cases are "5" not "3," but I wonder about the clear plastic that covers the case? Yes, I may have spent too much time in Grouchland today, but I think it's better to be safe than sorry. Here in NH it has been absolutely tropical! But, that doesn't mean that our feathered friends don't need your help this winter. I'm sure most of the seeds and berries found naturally have been picked over, so I urge you to buy, or make, a bird feeder. You'll be rewarded richly with color and song! We've had to discard several older books on bird feeders due to their deteriorating condition (I like to think of them as having been read to death), but, we've ordered some new titles to replace them. One is Jerry Baker's Backyard Bird Feeding Bonanza [690.892 BAK]. This book is loaded with helpful hints and interesting bird food recipes. One recipe is called "Figgy Pudding." "Figgy Pudding" would appeal to any of the fruit/berry eating birds. Are you ready for the scrumptious ingredients? Suet, peanut butter, cornmeal and Fig Newtons! Don't turn your nose up at the suet, birds that stick around NH during the winter months need the extra calories, and, they don't have to watch their cholesterol levels! 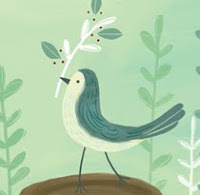 Baker's book is fun, but The Backyard Bird Feeder's Bible: The A-to-Z Guide to Feeders, Seed Mixes, Projects, and Treats by Sally Roth [639.978 ROT] is a visual delight with it's color photos, quality paper, and overall design. And, it's not without its share of unusual recipes. Try presenting a serving of "Spaghetti Supreme," to your backyard visitors! If you've been to the movies lately, you might have seen a preview for the new Hilary Swank film, Freedom Writers. The film, which opens tomorrow, is based on the book, The Freedom Writers Diary: How a Teacher and 150 Teens Used Writing to Change Themselves and the World Around Them by the Freedom Writers and their teacher, Erin Gruwell [304.235 FRE]. The book came out in 1999, and all of the 150 students graduated from high school. The Erin Gruwell Education Project continues the work started by the teens back in 1994. Also being released this month is a new book by Erin Gruwell called Teach with Your Heart: Lessons I Learned from the Freedom Writers. Check the library in a few weeks to see if it has come in. So How Ya Doing with Those New Year's Resolutions? Okay, so I don't make New Year's resolutions. If I have no expectations, then I won't be disappointed if I don't meet them! I'm all for being happy! The U.S. government lists 13 popular resolutions and gives a little information on how to fulfil them. But, if you're really serious, you should come to the library and read up on dieting, or organizing, or quitting smoking, or anything else you think you need to do to be a better person. As far as I'm concerned, you're automatically a better person if you pick up a book and start to read! How about this for a resolution? I resolve to read a book in a genre I never read. That would probably be Speculative Fiction (science fiction, fantasy, alternative history). Any recommendations? It would need to be something that has fewer than 300 pages (200 would be better). It shouldn't be part of a series because I don't have time to keep up with a series. It should be well-written (that should go without saying). Post your suggestions in the comment section. I'll let you know next January if I've kept my resolution! I saw the movie Dreamgirls the other day and was pleasantly surprised! The music was fabulous and fit perfectly within the story. Jennifer Hudson's voice is so packed with emotion it'll take your breath away. I especially liked the hairdos and costumes that recreated the sixties and the seventies. 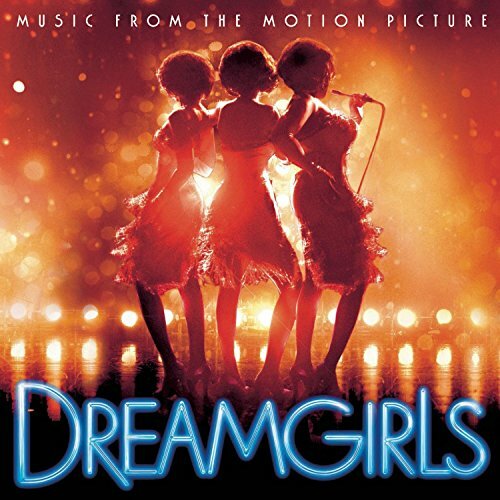 You too can enjoy the music of Dreamgirls by borrowing the soundtrack from the library [CD SOUNDTRACK DRE]. Berry, Gordy. To Be Loved: The Music, the Magic, the Memories of Motown: An Autobiography [B GOR]. Hine, Thomas. Populuxe [973.92 HIN]. Rielly, Edward J. The 1960s [973.923 RIE].